Day 1: Bienvenido a Espanya! 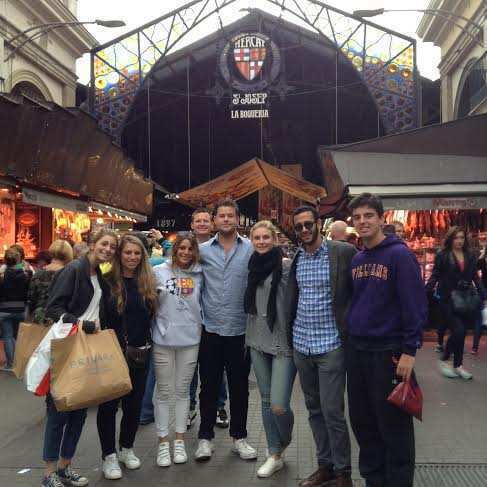 We got to our hotel which is located three minutes from la rambles, the center of the city. We stored our luggage, Jade changed her sweatpants to jeans, and we headed out to start our trip! First we went to casa batllo, an extraordinary building that was renovated by Spain’s most famous architect, Antony Gaudy. This house looks like it’s some sort of living and breathing creature! We continued to Casa milla, another Gaudy ‘crazy architecture’ type of house. The highlight was the amazing rooftop with a beautiful view over the city. We headed back to the hotel, showered, and left to Poble Espanyol. This site was built to perpetuate the life in the different Spanish villages. 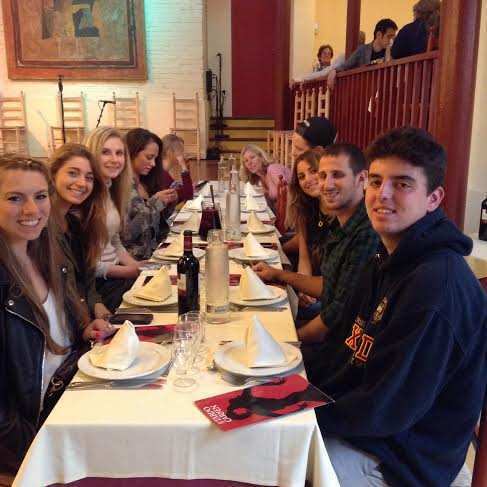 At Poble Espanyol we ate dinner. We ate a very diverse Tapas meal combined with sangria. 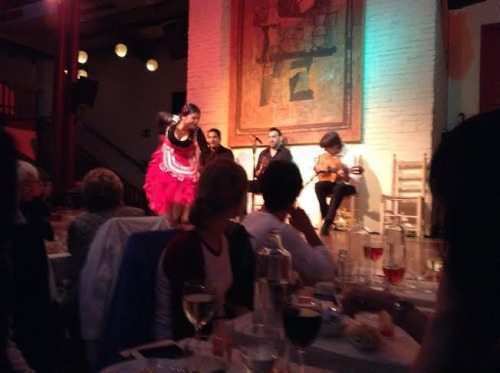 We watched a Flamenco show. The dancers were extremely intense and very talented. No one was left indifferent and the show ended with a standing ovation. After the show, as we were walking to font Magica de Monjuic, we encountered what seemed like a random firework show, but as we got closer we realized that it was some sort of reenactment of a Catalonian traditional fire run. From what we gathered from the few people that were not wearing costumes,that this ceremony of running with a torch, is meant to clear your soul. We eventually managed to disengage from that weird site and left to see the light show at the fountain. 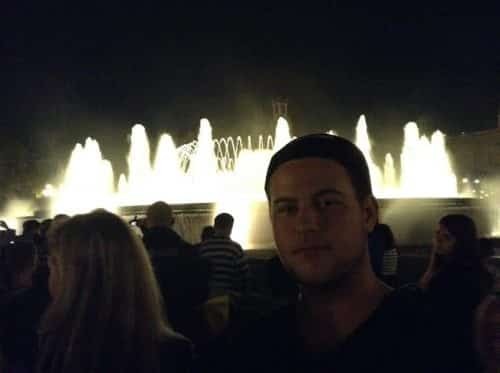 Even though some skeptical comments about the quality of the coming show were made by a certain students (Dylan), the light and water show was spectacular! The students were impressed. 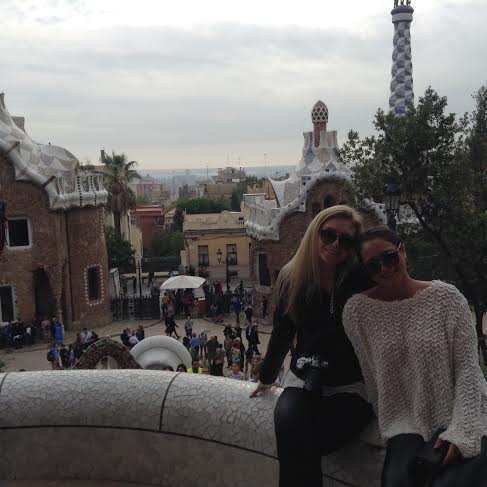 We had another great day today in Barcelona! We started our day on the tourist bus which we absolutely loved! You get to sit high up and just see the city while hearing interesting facts on your earphones! Also, I couldn’t avoid feeling a very typical Israeli sense of pride when I saw the audio guide had a Hebrew option! So while I chose the familiar language easy option, Julia was debating rather she should use the opportunity to work on her Hebrew or listening in English and get all the facts right. We got off the tour bus at Gaudi’s unfinished humangous church- La segrada familia and went back on to drive to Guell park. I know it had been a theme across our last two days but, yes, Guell park is another one of Antony Gaudy’s master pieces. When walking in this park that is constructed by yet some more surrealistic architecture and amazing botany, it literally feels like something out of the Alice in Wonderland story. 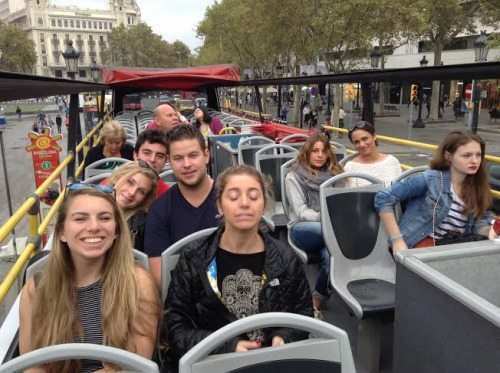 The students loved the park and after strolling down its paths and taking some pictures, sipping a cup of coffee and taking some more pictures, we got back to our two levels tour bus and continued our ride. After Guell park we grabbed lunch and met with Gil who joined us a little late in Barcelona. Together we walked to the Spanish Arc de Triomf to start a street art tour. This street art tour was definitely one of the highlights so far! What’s interesting about graffiti and street art in Barcelona, is that it only started after the death of the infamous General Franco. Graffiti was not allowed before his death and neither after his passing but, once this leader was gone a new feeling of liberation arose and law enforcers preferred looking away when seeing street artists coloring the walls. That is definitely not the case in Barcelona now but there are still plenty of street art to see. On this tour we got to know a lot of small cool gems of the city and the interesting art works outside and inside different galleries. 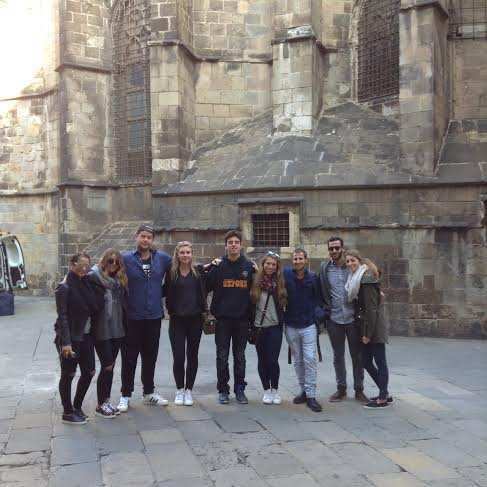 The tour also introduced us the the Goth and El Born quarters of the city. The students were really into the tour! On our way back Emma mentioned to me that she is now much more observant of the little details and art pieces you usually walk by and not notice, which makes walking the streets much more enjoyable. After the tour we went to Maccabi restaurant, a kosher tapas place, which according to Gil who did his research before coming, is a very well recommended place. We had a very nice dinner together in a private reserve room surrounded by quite a few Israeli guests that came to dine. From the restaurant we continued to Fuensanta Alcala’s house. Fuensanta is the mother of one of our former students, Gisela, and she had hosted us in her house to tell us the story of Spanish Jews before and after the Spanish Inquisition. Gisela was there as well to translate and answer question and she started by telling the group a little about Catalonia and the political and economical situation in Spain. Dylan showed some really extensive knowledge in regards to the Spanish economy (unemployment is currently at 22%) and Cataluniyan’s aspiration of becoming a separate country. Fuensanta told us how a member of her family who was a very well known religious Christian figure, had researched the family history thinking he’d find an impressive legacy of religious leaders. Instead he found out that his family was forced to convert from Judaism during the Spanish Inquisition. Consumed by what he found out he decided to tell his extended family about their origins. Fuensanta’s parents, (unlike many other members of her family) decided not to deny their legacy and so, at the age of 17 Fuensanta ,who grew up in an antisemitic environment’ realized she was Jewish. According to her, this truth had shade light on many costumes the family used to maintain like cleaning the house every Shabbat without knowing why. This unbelievable story had really shaken the group! Gisela also shared with the group how she grew up studying in a Jewish school with 8 students in her age group. We’ll get to hear more about the Jewish community in Barcelona when we meet Gisela and a few of her Jewish friends on Wednesday. We started our day with a tour of the museum of the well known artist Joan Miro. Miro is a very famous Spanish painter and sculpture and is one of the most famous abstract so realist artist. Miro’s works are spread out across the city and only when we got to the museum we realized we had seen some of his work during our rides on the tourist bus. 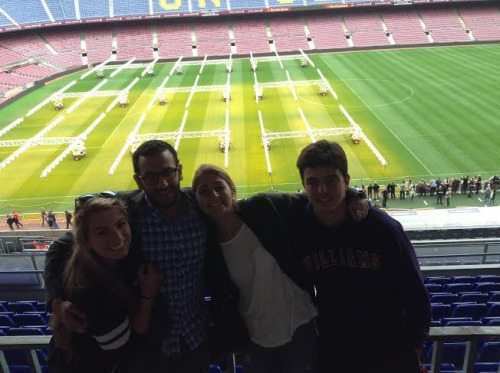 From the museum we continued to the biggest stadium in Europe, Camp Nou, the FB Barcelona stadium. I’m not a huge football fan (or soccer for the American crowed) but being at the stadium was definitely an experience, it’s huge! We walked into the FB Barcelona museum (yes they have a museum) that displayed Barcelona footballs from the 1930’s and Barcelona players shoes from the 1920’s. From the museum we continued for a walking tour of the stadium from the locker rooms to the court’s grass. I think that Kobi, that is simply a fan of every possible sports game , was the most excited about this experience and right away got a Lionel Messi shirt with our arrival. 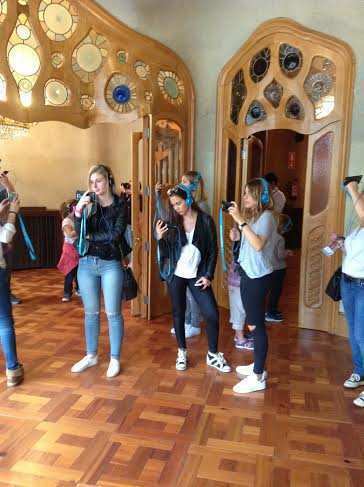 Bianca and Jade also left the place with matching Barcelona shirts. After being surrounded by all this sportiness, we all felt exhausted. Seeing photos of people running and sweating everywhere can really take it out of you. So we quickly went to the Lilla diagonal shopping center to get revived. Some of the students managed to really make the most out of those two hours in the shopping center, but Jade unfortunately “didn’t feel it” today. Maybe next time. On our way back we stopped at Mercado La Boquaria, Barcelona’s well known market place right on La Ramble street. It really is famous for a good reason, as it is filled with different colors, sounds and smells like we expected it to be. It was really nice walking around the market and we’ll try to make another stop there sometime this week as it is really close to our hotel. 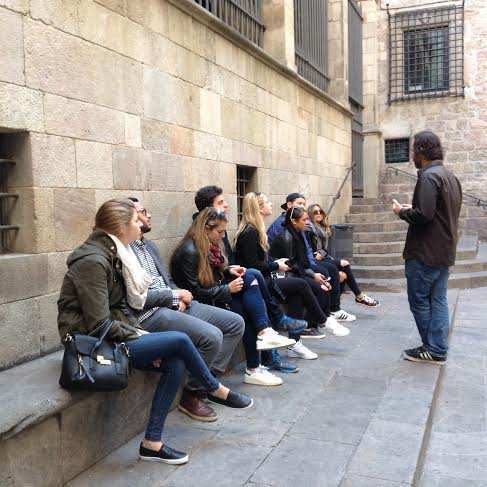 We started our day with a tour of the old Jewish quarter of Barcelona. Even though we all know how the terrible story of Spanish Jewry turned out, our tour guide, Adi, told us how the Jewish quarter was surrounded by walls, but not in the bad ghetto sense like we expect to hear. During the middle ages in Barcelona, these walls were actually built in the king’s orders to protect the Jews. Since the Jews were not paying their taxes to the church like the Christians did, the money from the Jewish taxes went directly to the king’s pocket. For that reason the Jews enjoyed a relatively prosperous period that lasted until the black plague. The Jews were blamed for the plague since most Jews did not get sick due to their better hygienic (customs like the mikve, washing hands and eating kosher meet). During the Spanish pogrom that followed the black plague, 400 Jews were murders and the rest of them fled. The Jewish quarter became christian. 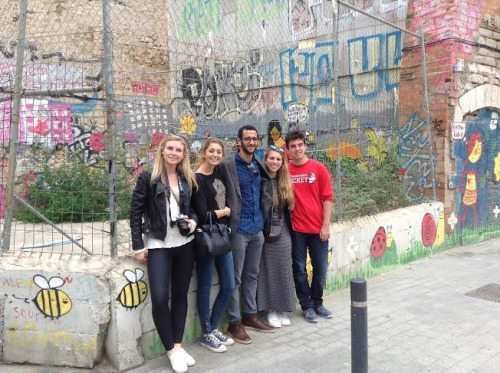 On our tour we discovered traces of the once prosperous Jewish life of Barcelona. For example, our tour guide showed us that the King’s palace was built from stones decorated with Hebrew letters. The palace was built 200 years after the Spanish inquisition and so, the builders probably did not know that it was Hebrew letters on the stones. The stones were taken from the remains of Jewish homes at Montjuick. During our tour we walked into an old synagogue that was discovered after a christian family had made it their house, we also stepped into a furniture store where the remains of a mikve (ritual bath) were found. The story of Barcelona Jews is a really horrific one and it’s only recently that the story of the Jewish quarter is being recognized. Even the law banning Jews from returning to Spain was only canceled in the late 1960’s. We really enjoyed the informative tour with our guide Adi, which is good because he’ll also be our tour guide tomorrow on our trip to Girona! 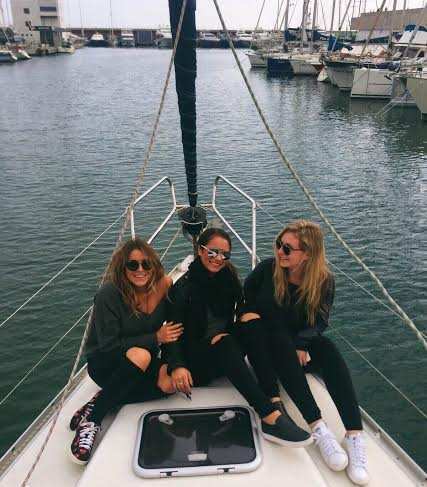 After lunch we went to the Barcelona Marina for a nice relaxing boat ride with our skipper Gero. After dinner we went to meet Gisela (former Aardvark students) and two of her Jewish friends who are involved in the Barcelona Jewish community. 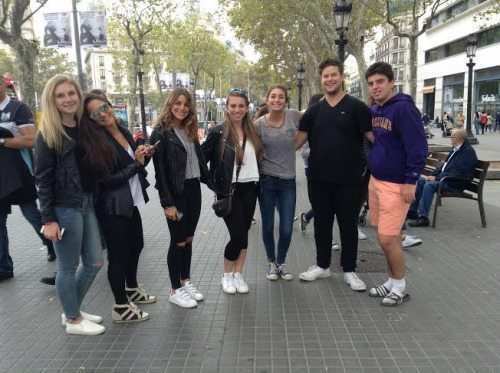 The Spanish students told us that they are aware that there are about 5000 Jews in Barcelona but they do not see them on their every day lives… Gisela said that marring a Jewish guy within the community is close to impossible due to the low number of Jews. One of her friends told us he met Gisela when they were preparing an activity for the Jewish community about Israel because the community here knows very little about it. He also said that you have to be well informed about Israeli matters because when people know that he is Jewish they immediately start attacking him about Israel’s actions. 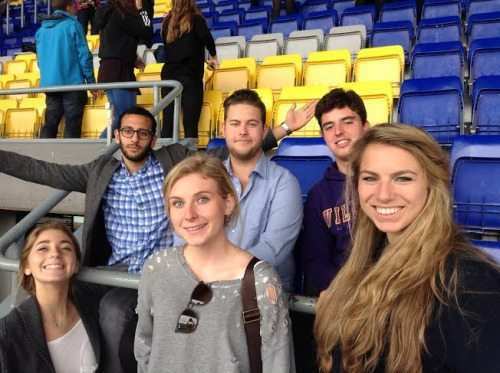 While talking to one of the students Julia was trying to figure out if she can still get on a birthright trip after aardvark ends and Alena gave another try to figuring out more about her Spanish heritage. 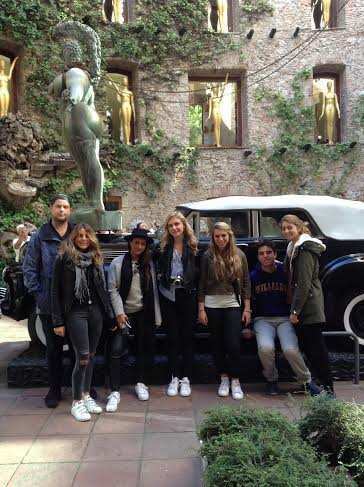 On Thursday, after checking out from our hotel, we went for a day trip out of Barcelona with our tour guide Adi. After an hour and a half on the road we got to the amazing Salvador Dali Museum. I believe you heard of this crazy artist with his surrealist pictures that can consist of elephants with thin long legs, dripping clocks etc. but nothing could have prepared us to how crazy and bizarre his museum was. First of all, the space of the museum was given to Dali by the municipality for him to create a museum for his own art. 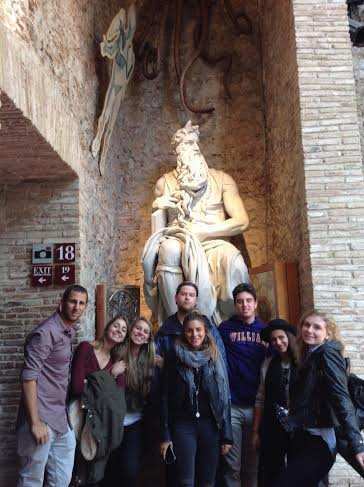 Everything in this place was built by Dali himself, and Dali was a little bit ‘Kookoo’ to say the least. Everything about this place was peculiar and the fact that Dali is literally buried in the middle of the museum wasn’t even that much of a surprise. One of the things that did surprise us is that there was a whole exhibition in his museum called Aliyah, consists of paintings Dali made after visiting Israel. 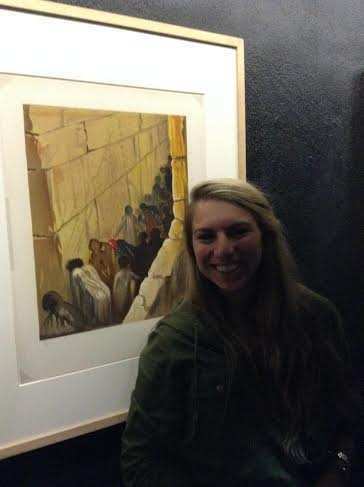 There was a picture of the wailing wall and a drawing of Ben Gurion among many other drawings inspired by Israel. From the Museum, we continued to Girona, a city where the next season of Game of Thrones is apparently being filmed but also, the birthplace of Nachmanidas and what was once a large Jewish community. So after our tour guide showed the group the castle where his friend took a picture with ‘Jamie Lanister’ (don’t worry about it if you don’t know the game of thrones show) he led us to the Main Street of the old Jewish quarter. The windows of the Jewish houses were sealed with iron plates so that the Jews who live there won’t accidentally look out to the street when a Christian wedding id passing by. The reason as to why is that it was considered bad luck for the bride and groom if a Jewish person saw their parade. We continued to the Jewish Museum where one of the exhibits was a headstone decorated with Hebrew. The headstone was found in a family farm using as a water trough. I realize while I am writing these lines that all I write about Spanish Jewry sounds very depressing, but Spanish Jews simply had it hard… The museum was very interesting and summarized the Jewish quarter tour we started the day before. On the attached photos you’ll find a picture of Kobi kissing the behinds of a stone statue shaped like a Lion climbing a pole. Do not be alarmed, this is a custom meant to assure his safe travel. Guess what, it worked! We all arrived safe and sound back to Israel, mostly I believe, thank’s to Kobi. That is also the time to tell you that at the Ben Gurion airport, before passport control and next to the restrooms, a small ceremony was held to choose the Aardvark Top Traveler. It was not an easy competition let me tell you… Many of the students desired this title but in the end the theoretical award went to Kobi for being so easy going, always listening to the explanations and never interrupting. Thank you Koby for being a great travel companion. The unofficial public’s favorite title went to Dylan Schwartz for being so positive and smiley for the entire five days!